Analysis of satellite imagery reveals new destruction of Rohingya villages during October and November 2017 in northern Rakhine State in Burma, Human Rights Watch said on 18 December. Human Rights Watch identified 40 villages with building destruction occurring in October and November, increasing the total to 354 villages that have been partially or completely destroyed since August 25, 2017. During this period, thousands more Rohingya refugees fled Myanmar and arrived in Bangladesh. Satellite imagery confirms that dozens of buildings were burned the same week Myanmar and Bangladesh signed a Memorandum of Understanding on November 23 to begin returning refugees in Bangladesh within two months. On November 25, satellite data detected an active fire and building destruction in Myo Mi Chang village in Rakhine State’s Maungdaw Township. Four villages suffered building destruction between November 25 and December 2. Brad Adams, Asia director at Human Rights Watch, claims the commitment with Bangladesh for a safe return of refugees was just a publicity stunt. “The satellite imagery shows what the Burmese army denies: that Rohingya villages continue to be destroyed. Burmese government pledges to ensure the safety of returning Rohingya cannot be taken seriously,” he says. 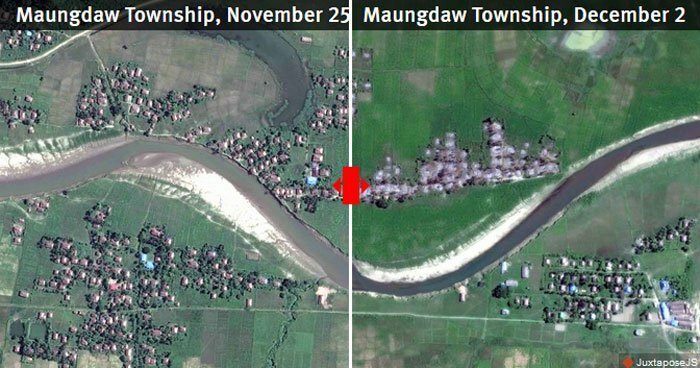 Human Rights Watch has used satellite imagery to assess and monitor over 1,000 villages and towns in the townships of Maungdaw, Buthidaung, and Rathiduang, where the Burmese military and vigilantes have allegedly engaged in attacks on Rohingya. Human Rights Watch found that the damage patterns in the 354 affected villages are consistent with burning occurring in the weeks after the military operations began in late August. Of the 354 affected villages, at least 118 were either partially or completely destroyed after September 5 – the date the Myanmar State Counsellor’s office announced as the end of clearance operations. Of the 40 new villages with building destruction identified by Human Rights Watch, 24 were destroyed in October, 11 in November, and 5 over both months. The latest documented arson attacks occurred between November 25 and December 2 in four villages. Satellite data from environmental sensors detected an active fire at 12:30 p.m. in the Rohingya village of Myo Mi Chang in Maungdaw Township on November 25. Building destruction was concentrated in the center of the village, which was undamaged until this attack. Other villages subjected to arson attacks during this period include Nga/Myin Baw, Goke Pi, and an unknown village in the village tract of Zee Pin Chaung. On November 23, Bangladesh and Myanmar signed an Arrangement on Return of Displaced Persons from Rakhine State on behalf of “residents of Rakhine State” who crossed from Myanmar into Bangladesh after October 9, 2016 and August 25, 2017. In letters to both governments, Human Rights Watch said the agreement should be shelved, noting the lack of involvement by the United Nations and the unrealistic timetable for safe and voluntary returns starting in January 2018. Since late August, 655,000 Rohingya were forced to flee to neighbouring Bangladesh. Human Rights Watch has found that this campaign of ethnic cleansing amounts to crimes against humanity. Attacks by the Arakan Rohingya Salvation Army (ARSA) on 30 security force outposts and an army base that killed 11 Myanmar security personnel set off the Myanmar military “clearance operations” against the Rohingya. In November, a Myanmar army “investigation team” report concluded that there were “no deaths of innocent people” during the military operation in Rakhine State, and that at least 376 “terrorists” were killed during fighting, contrary to information reported by the UN, media outlets, and human rights groups, including Human Rights Watch. The humanitarian group Medecins Sans Frontieres (MSF) on December 14 concluded that at least 6,700 Rohingya were killed in the violence, over 700 of whom were children, based on survey data of refugees in Bangladesh.